SecretSales.com includes secret sales with fashion, accessories, home wares, sports equipment, electronics & technology, travel items, jewellery & watches and children's products. All items are 100% genuine and they work closely with the brands and premium suppliers to ensure to offer you the best possible products at the lowest prices. Items are put on sale on a brand-by-brand basis and these sales will continuously change every few days. Every week is different! Save money with discounts and savings from VoucherGurus.co.uk. Click here to see the secret sales for over 100 different brands at Secretsales.com. Act now and take advantage of up to 75% off select Diesel fashions on SecretSales.com. Check out SecretSales.com and find savings of up to 80% on exclusive brands. 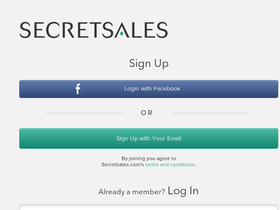 Gain access to exclusive online sale with Free registration at SecretSales.com.